En las semanas previas al Séptimo WEEC que se celebró en Marrakech con gran éxito (www.weec2013.org), la Secretaría Permanente ha consultado a los que ya se han incorporado a la red mundial mediante la firma de la Carta de Principios. La pregunta que se ha hecho era acerca de la evolución futura y, en particular, acerca de la decisión de hacer la red más formal e "institucionalizada". Co-organised by the Foundation Mohammed VI for the protection of the environment an the Permanent Secretariat Of the WEEC Network, it was supported by international institutions, such as UNESCO, UNEP, ISESCO, the Federation for the Environmental Education (FEE), whose highest delegates have come to participate in the Congress’ works. Under the High Patronage of His Majesty King Mohammed VI and under the Chair held by Her Royal Highness Princess Lalla Hasnaa, President of the Mohammed VI Foundation for Environmental Protection (FM6E), very aware of environmental education’s role, has ensured that the Kingdom hosts WEEC for its ten year anniversary. Nearly 1,500 delegates from around the world are expected to participate for one week at the 7th WEEC in Marrakech, an event where experts come to discuss and exchange experiences on the important issue of education and environmental awareness. The Mohammed VI Foundation, which co-organized this conference on environmental education, wants to make an eco-friendly event and reduce its carbon footprint to a minimum. It is also an opportunity for the Foundation to promote its carbon program. From June 9 to 14th, the World Environmental Education Congress 2013 is about to receive over 1,200 delegates from around the world to share their experiences on environmental education and the best ways to raise awareness about these critical issues. Advocating teaching by example, the event organizers, the WEEC Secretariat and the Mohammed VI Foundation for Environmental Protection, opted to make this conference a green event and issued a charter advocating ways to protect the environment during the six-day conference, and a daily approach after the conference completion. 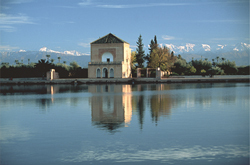 The 7th WEEC (World Environmental Education Congress) will be held in Marrakech's Palais des Congrès from 9th to 14th of June 2013. What are the main educational themes that run through our century ? What do we need in order to develop a more active nation, a more responsible social consciousness, a more tolerable future ? These will be the main topics discussed at the Palais des Congrès in Marrakech, from 9th to 14th of June 2013, at the 7th WEEC, World Environmental Education Congress. The Congress is held under the high patronage of His Majesty the King Mohammed VI, and under the presidency of Her Royal Highness the Princess Lalla Hasnaa, President of the Foundation Mohammed VI for Environmental Protection.